Today is Asadha Shukla Dwitiya, the second day of the bright lunar fortnight of the month of Asadha. It is celebrated as Rath Yatra or #RathaJatra. This year, Rath Yatra is on 29th June. 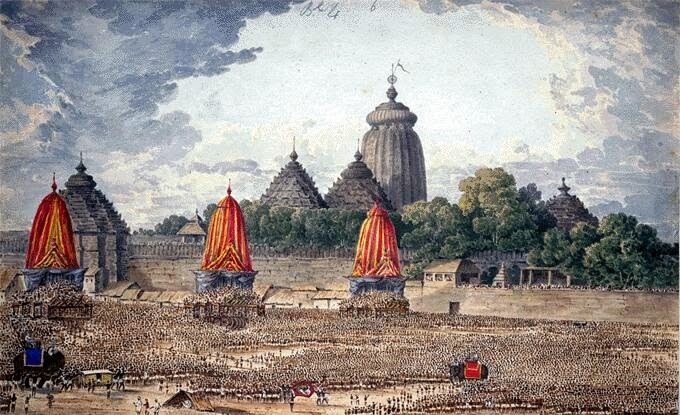 The Rath Yatra festival began in the Shri Jagannath Temple, Puri, Odisha, India. Rath means Chariot/Car while Yatra means Travel. Rath Yatra is a centuries-old cultural festival. These days the Rath Yatra is celebrated worldwide. Lord Jagannath is the "Lord of the Universe." Odias believe- He is a "living God" whose "round eyes are watching everything". Lord Jagannath has fascinating tales and ancient history. "I offer my humble prostrated obeisance to the eternal supreme personality of Godhead Lord Jagannatha, the supreme Soul." In the Shri Jagannath temple, the three deities are three siblings- namely- Lord Jagannath, Devi Subhadra & Lord Balabhadra. On Rath Yatra day, the trio emerge out of their abode- the Shree Mandir at Puri and embark on a journey to visit their aunt at the Gundicha temple. The siblings cover this distance of three kilometers thanks to their bright and amazing chariots that are pulled by their frenzied devotees. It is celebration time as the deities are happy as they enjoy their annual outing. Don't we love it when we go for trips, especially to our loved one's place? The Gods also love it! By emerging out, the Gods give darshan (sight) to all their devotees irrespective of any barriers like wealth-status, religions and nationalities. In other words, the three siblings stand for the entire human-race with different skin-colours- fair, yellow & dark. The criterion for entering the Temple is- only Hindus are allowed inside. Also, photography is not allowed inside the Temple. Rath Yatra festival ensures Gods are accessible and also we can take photographs. The construction of the Chariots begins on the auspicious day of Akshay Tritiya, two months before Rath Yatra, in the third day of the bright fortnight of the month of Vaisakha. 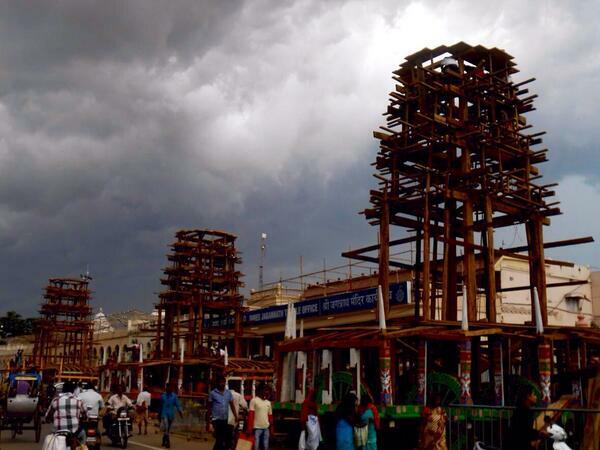 On Akshay Tritiya, the sandalwood festival or Chandan Yatra begins, that lasts for three weeks. Look at the giant wheels! The Chariots are the fruits of the love and labour of skilled craftsmen. The Chariots are awesome with fine details and paintings. Some days ago, on Snana Yatra, Lord Jagannath and His siblings had fallen sick after taking a bath. Rath Yatra is a celebration after the siblings have recovered from fever/sickness. Aren't we happy when we feel hale and hearty? The Gods are happy too! A glimpse of Lord Jagannath on His Chariot is believed to be very auspicious as per ancient texts and scriptures. "When Jagannatha is on His Rath Yatra cart and is moving along the road, at every step there is a loud presentation of prayers and songs chanted by large assemblies of brahmanas. Hearing their hymns, Jagannatha is very favourably disposed towards them. He is the ocean of mercy and the true friend of all the worlds." 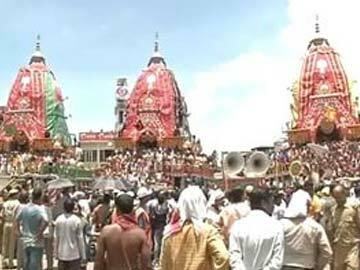 Some TV Channels air the Live telecast of the Rath Yatra Puri. This cultural heritage advocates equality &unites everyone together. What a master plan of the Lord of the Universe! You can also read my Post- SUNA BESA & get treated to the Gods in Gold! Next year is special as there will be the "Nabakalebara" celebrations in which the Gods will attain new bodies, after a gap of 19 years. In case you are yet to visit Odisha, India, do plan your trip & book your tickets for 2015. All the pics with no source-credit above are courtesy Twitter- @arvindpadhee, @devasissarangi, @diana_sahu, and @BBSRBuzz & many of its enthu contributors. For ABC Wednesday - Y For Yatra. Yatra means Journey. I have a query. Are new chariots built every year? Thanks a lot :) Glad you liked it. Yes, new Chariots are built every year. Thanks a ton and I m very much greatful to you for giving us an rare oppourtunity to have a magnificant darshan of lord Jagannath... Really Thanks ..
Have a fantastic day Ahead !! You can switch on the TV & catch the live telecast now on DD National. So glad to have a darshan here. Wow, quite a lot of information. And really good use of pictures. Glad to be part of the rath yatra through your comprehensive blog post. It's a credit when we exceed expectations. May the Lord give us strength! Much needed for me... It feels good to know about Lord Jagannath :) Very well presented Anita, just as to reach even a small kid :) Just want to ask you, are they making the chariots every year? If so, it is really interesting! Thanks for reading & for your appreciation, Sindhu. Yes, the Chariots are made every year. Do plan a visit to Odisha next year and be a part of this auspicious occasion. Yes, Nabakalebar is when the Gods will get new bodies. Many devotees will assemble from the world over to witness this rare event. Am sure a creative person like you will love the arts & crafts of Odisha. Do visit. Wonderful post, Anita. :) Thanks for sharing. Always love your work sis...Keep up the good work..Give us more info!! Thanks a ton Anita. I had my darshan of rath yatra here on your blog. Beautifully compiled. Thanks Sangeeta for such nice words :) Glad you liked it. It gives me goosebumps that there is continuity of tradition for centuries. This is India. Here life goes on and on. Indian culture & festivals are amazing as they are still celebrated with gusto even after so many centuries. This speaks highly of our Incredible India. Such a wonderful post Anita...Thanks for sharing the amazing tradition. Have heard a lot about it. Love how you have decoded the whole event in simple lines and with so many meaningful images. Welcome to my space, Chaitali :) Thanks for reading and sharing such beautiful words! Long time when I visited Puri for the Rath Yatra. That's great to know, Poonam! Technology has made things easy for us! Very informative post , old black n white pics are awesome. Thanks Mahesh! Glad you liked this. Thanks Nagini! Delighted you liked this. Yes, Soumya. Three mighty Chariots for the three Gods. You have given a complete description of it. The old drawings and pictures shows how well organised the affair was. Thanks Haddock for reading & sharing your views. Yes, you are right. Rath Yatra has been systematically & religiously conducted for centuries in a careful, focused & methodical manner. That's so nice, Bikram! Thanks for sharing! Hope you had the awesome Mahaprasad in the Temple premises when you visited Puri. Very interesting information and such detailed photos. I liked seeing the building of the chariots. Beautiful photos :) Thank you very much for sharing :) feeling happy to get darshan of Rath Yatra Puri, here. wish to visit in near future. Thanks Deepa :) The pleasure is mine. Very interesting culture you have! The photo of the wheels took my breath away! Yes, Leslie, Indian culture is centuries-old, very incredible, precious & interesting. Such unique festivals are intrinsic to India! This is fascinating to me, and I love that it is a festival representing all races. Blessings! Yes, Arnoldo! That's the greatness of Lord Jagannath- the Lord of the Universe. Incredible and fascinating post - thank you so much for introducing me to the Rath Yatra festival. Enormous! What a wonderful account! The devotion expressed through loving labor is impressive. It's all the grace of Lord Jagannath! The tales of Lord Jagannath are simply amazing. Very amazing collection of antique photographs of lord Jagannath....I congratulate you and thank you ma'am for bringing this to us.